Hopkins, Burt C. The Philosophy of Husserl. Durham, England: Acumen, 2010. xii + 290 pp. 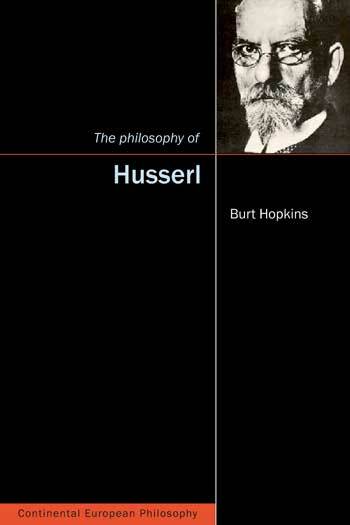 Burt Hopkins’ The Philosophy of Husserl provides a comprehensive survey of Husserl’s philosophy from a particular, coherent point of view, and, more importantly, it does not merely tell us “about” Husserl, but achieves its aim by employing Husserlian phenomenological methods themselves. The presentation is guided a) by the task of situating the “salient discoveries” of Husserl’s phenomenological investigations “in relation to traditional philosophy” (1), while at the same time refraining from uncritically assuming the presuppositions that his major critics make with regard to this relation; b) by the goal of clarifying Husserl’s relation not merely to past philosophers, but to questions of history per se (including both early critiques of historicism and the later turn to history, with particular attention to how “intentional history” stands with regard to “actual” history); and c) by the aim of demonstrating “the unity of Husserl’s philosophical enterprise from beginning to end” (2), including the abiding principles motivating his own moments of self-critique and correction (cf., e.g., 114ff. for enduring elements of Husserl’s understanding of transcendental-phenomenological reduction). As the presentation moves through the exposition of the stages of Husserl’s phenomenology, one encounters recurring themes and concerns (e.g., the constitution of ideality), along with a number of specific connections with traditional philosophy—e.g., Leibniz, who is discussed as furnishing a precedent for Husserl’s discussion of adequate and inadequate evidence as well as being the source of the notion of the “monad” and of the attendant “non-Cartesian metaphysical problem that Husserl thinks his phenomenology can solve” (162). However, the most original contribution of the book is to situate Husserl’s eidetic phenomenology in the context not only of Aristotle’s critique of Plato’s account of eidē, but of the differences between Plato’s “Socratic” theory of eidē and his “arithmological” theory of eidē (with the major issue having to do with the “manner of being” proper to the eidē). These controversies at the dawn of Western metaphysics are in turn used to counter the claims of both Heidegger and Derrida concerning the deficiencies of Husserl’s philosophy, especially the defects that they trace to his relation to the Greeks. Thus Hopkins’ book is by no means a simple narrative survey of important themes in Husserl, but has an arrow-target structure meant to shed new light on what is at stake in the Husserlian project as a whole, as well as in the very tradition from which it stems. Hopkins identifies the “most basic principles” of pure phenomenology as “presuppositionlessness, pure reflection, essential intuition” (6), and the presentation throughout is concerned to show the reader how Husserl puts these principles into practice. But Hopkins himself is writing as a phenomenologist who is engaged in bringing phenomenological methods to bear on the matters he is discussing. This shows up in various ways (see, e.g., 144ff., in the context of speculative theories about “pre-reflective” self-awareness and the unity of consciousness), and indeed, suggests that the book may be taken as addressing the question of how phenomenology can address an “interpretation” with phenomenological means—most prominently, the interpretations Heidegger and Derrida offer both of “the Greeks” and of “Husserl.” Hopkins makes brilliant and sustained use of Husserl’s fundamental drive to avoid presuppositions and to turn instead to phenomenological evidence as the appropriate warrant for knowledge claims. This, however, cannot merely be a turn to historical texts, but requires an engagement with the matters themselves discussed in the texts. To make a long story short, Hopkins concludes that Husserl does indeed stand within the horizon of the Western tradition of philosophy, but is not driven by a “metaphysics of presence”; instead, the key issue he inherits from this tradition concerns “multiplicity (Mannigfaltigkeit) and unity as they function in his account of the constitution of the appearance and appearances of what appears” (267; cf. 281 n.1 for a splendid list of ways in which Husserl addresses this question). In summary, one can note that this book does not merely introduce Husserl’s thought in its own terms, but attempts (here borrowing the words of Edward G. Ballard himself) “to be critical of Husserl’s self-critical thought.” And Hopkins approaches this task not by adopting the methods of fundamental ontology and deconstruction, but, on the contrary, by demonstrating that these methods are not up to the task and Husserl’s own methods are. The end result is an ambitious, concentrated philosophical work that demands a reciprocal concentration on the part of its readers—a work that is worthy of recognition as the winner of the Ballard Prize.